Description: Recently, the WC has only been getting a single unit down here on the transfer. Here CN 2309 is seen pulling out the Commericals cut. Description: Inbound coal load from Farmersville. Description: This shot is one of the reasons I wanted to go to Duluth, getting a train in good light coming over the bridge just outside of Steelton Yard. Here we see CN 2309 leading an SD70M-2 and IC 1034 over the bridge and towards Pokey Yard. This shot would have been just how I pictured it except for the white car in the foreground, oh well, still looks like a nice shot to me. Description: At the end of the day, I caught the WC getting ready to make their pickups at New Brighton. I shot the 2309 about two weeks ago when I was in Duluth. Description: 4 engines & two hoppers. The front two locomotives will cut off and run south to Mattoon. The remaining engines will drop the cars off at CSX. Description: Approaching Broad Street, CN 2309 brings the auto racks of M451 north up the Holly Subdivision. Title: Another CN shows up with a new GEVO and SD70M-2 to boot! Description: The locomotives from L502 await clearance to move back to their train after dropping off 2 cars in the yard. Description: The locomotives of L502 move out of the yard to hook back on to their train. 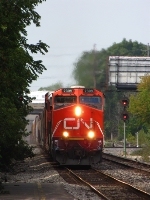 Description: CN L502 passes CN northbound auto train on speed restriction as it moves south out of Durand. Description: An underpowered L502 grinds out of Durand with a very long train in tow. Description: CN 2309 splits the signal masts as it crosses Pittsburg rd. putting on a great show as it powers a long train behind it. Description: CN 2309 works to push its 2 cars back into the yard off of L502. Description: The pair of ES44DC's wait in the yard for 2 mainline freights to clear.